Joy’s LIFE (Look Incredible, Feel Extraordinary) Diet: Four Steps to Thin Forever, is a four step program that is designed to help dieters to overcome negative lifestyle habits and lose weight. The program is the creation of Joy Bauer who is the nutrition and health expert on the Today Show’s Joy Fit Club, which profiles ordinary people who have lost over 100 pounds through diet and exercise alone. Bauer says that her plan can help you lose five pounds in the first week and will have you waking up feeling energized and enthusiastic. Release: An intensive week that is concentrated on letting go of negative eating habits. Sugar, salt, alcohol, caffeine ( see Caffeine Informer for an extensive caffeine database), and processed foods are forbidden in this phase. Relearn: This step involves two weeks where you will learn to reprogram your appetite and discover the joys of eating healthy foods. Reshape: A lifestyle eating plan that can be followed until you reach your goal weight. Reveal: In this stage you will celebrate your success and learn how to maintain your weight loss as a LIFEstyle. Dieters are encouraged to eat on a schedule and to have three meals and one afternoon snack daily. A sensible breakfast within 90 minutes of waking is regarded as essential. Dinner each day should always start with a large salad or vegetable soup based on low carbohydrate vegetables. Additionally dieters are encouraged to drink lots of water during the day as well as two glasses of water half an hour before lunch and dinner. Chicken breast, fish, lean meat, tofu, egg whites, fruit, non-starchy vegetables, raw nuts, low calorie salad dressing, low fat mayo, mustard. Low carbohydrate vegetables are permitted in unlimited quantities and dieters are advised to snack on these foods whenever feeling hungry, especially in between meals. Examples include celery, carrot, mushroom, cucumber and broccoli. Bauer includes an exercise plan that involves three steps that are linked to the diet plan. Step one is 30-60 minutes of cardio every day. In step two the cardio exercises are continued with the addition of interval training three days a week and strength and stretching exercises 3-5 days a week. Step three involves an additional circuit of strength and resistance exercises. 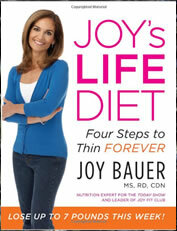 Joy’s LIFE Diet retails at $25.99. Easy to follow and includes some flexibility. Does not require special foods. Encourages a wide variety of healthy foods. Good for dieters with families as there is no need to prepare separate meals. Includes menu suggestions and recipes. Addresses psychological factors involved in weight loss. Provides an option of online community support and additional tools such as calorie calculators, progress trackers, a custom meal planner and a message board. The first stage is very restrictive and could be difficult for many dieters. Some dieters may find that the meal plans are lacking in variety. The meal plans are not easily adapted for vegetarians. Will not appeal to dieters who don’t like to follow structured meal plans. Some dieters may have difficulty maintaining the exercise recommendations. A strict introductory program can help increase motivation for some dieters because it can produce rapid results. However the combination of a dramatic dietary change in combination with 30-60 minutes of cardio exercise every day may prove to be very challenging for many individuals with a risk of triggering yo-yo dieting. Although the book includes some common sense advice it does not really offer anything new in terms of the diet plan. It will appeal to those who have none or very little experience with dieting and are looking for a structured program to follow.